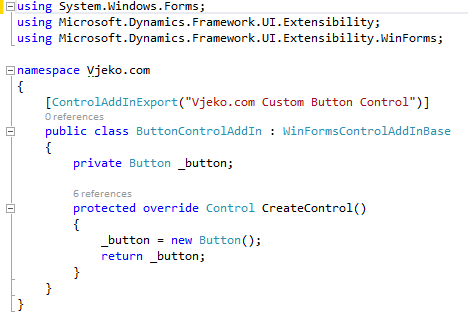 The control add-in framework in NAV 2013 is great, because apart from allowing you to put a custom Windows Forms control on the page, it also allows you to interact with it through properties, methods, and events. In my classes I typically create a custom text box control that exposes a property to set the background color on the text box. It only takes adding a property of type Color, decorating it with the ApplicationVisible attribute, and you are ready to play. 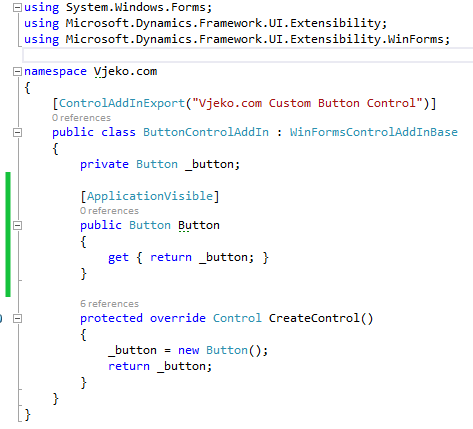 However, if you want to enable setting all properties or invoking all of the methods the control supports, you could start wrapping the internal control into new ApplicationVisible properties and methods. There is no end to this. Even though this is an incredibly simple concept, it just never crossed my mind: why not exposing the whole control as an ApplicationVisible property – this would in turn enable you to access the whole control, all its properties and methods (unfortunately, not the events – the delegates are still not supported in C/AL) without having to write a single additional line of code. I give full credit here to my friend John who gave me thins hint. Thanks, John! Even though the C/AL Symbol Menu will not give you access to any of the inner control directly, all the members are still there for you to access. Again, as I said – you can’t subscribe to events. This is one of those limitations of .NET Interoperability I wrote about last year that I hope get sorted out at some point in future. However… an idea has just crossed my mind and I’ll keep fingers crossed that I have enough time to try it out. If it works out, my next blog post will explain just that – subscribing to just about any event the inner control exposes. Your instincts may yell “ProviderID” at this moment, but there are some problems with it. ProviderID is used to set the link between different part controls on the same page. But if the link from the provider control results in no record being selected in the target part control, then the OnAfterGetRecord trigger in it does not fire, and you cannot update the content. Another example may be this: depending on the line selected in the lines part, you may want to show either of two factboxes. Imagine – on a sales order, if you are on a line that sells a resource, you want to show the Resource factbox; and if you are on a line that sells an item, you want to show the Item factbox. You get the gist. There are not many ways you can achieve this. As a matter of fact, when helping my colleague, I couldn’t think of any. Except for an old trick which, unfortunately, does not work at all in the RTC. In the good old days of the Classic client, when heroes roamed the Earth, you could pass the CurrForm as a reference onto a function in a subform, which would then store the reference to the main form in its own Form variable. Then, when something happened in the lines, and you wanted to let the master page know, you called the function on the stored reference. It worked like charm. However, in NAV 2013 (and possibly 2009 – can’t bother to check) you cannot assign one page variable to another. Furthermore, the CurrPage variable has page ID in some funny range, and does not even correspond to the actual page number. All in all, no way you can pass, or retain, a reference to a page object, let alone the current page reference. So, how do you have two, three, or more pages (or page parts, for that matter) talk to each other to pass some information when needed, in all those situations when ProviderID simply doesn’t get the job done (I could bore you to death listing those situations)?